A New Year’s Eve winter storm drenching Holiday Bowl fans and dropping varying amounts of rain countywide — and snow in the mountains above 4,000 feet — has departed leaving cool, dry conditions, the National Weather Service said Tuesday. “A very dry, continental air mass has now moved in,” NWS forecaster Joe Dandrea said. Rainfall amounts were about half an inch in Lakeside and Lemon Grove. El Cajon received 0.64 of an inch. Palomar Mountain got 0.77 of an inch. 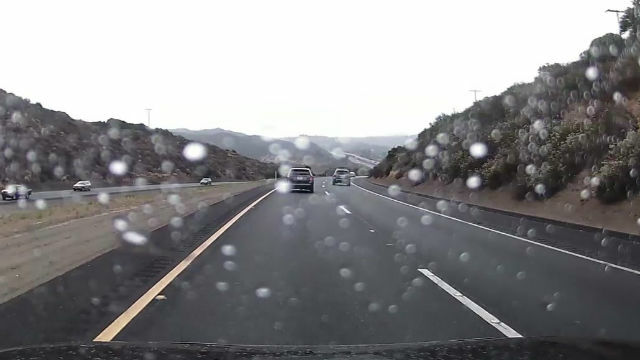 “There was fairly decent rainfall along a strip northeast of downtown San Diego up through Lakeside and east through Alpine to Santa Ysabel,” the meteorologist said. A total of 2 1/2 inches of snow fell in Julian. Mount Laguna and Palomar Mountain each received about one inch of snowfall. Dandrea said their were several reports, mostly from northern San Diego County, of highly visible funnel clouds that formed during the New Year’s Eve storm. None touched ground or caused any damage, he added. Dandrea said temperatures countywide for this New Year’s were running five to 14 degrees below normal. But he added that was about to change. “It’s going to start warming up, and by Friday we should be close to average,” the forecaster said, adding daytime temperatures the rest of the week were expected to be in the mid-60s along the coast and inland valleys. “It looks like it will be crystal clear for the next couple of days,” Dandrea said. The NWS said there was a small craft advisory in effect for coastal waters Tuesday. A wind advisory continues to be in effect for the mountains and foothills. The NWS forecaster said another storm is likely to bring a chance of rain by the end of next weekend.